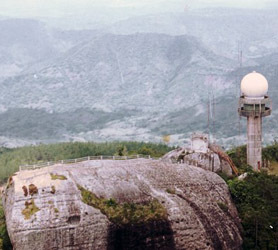 At just over 1234 meters (4000 Feet) above sea level La Gran Piedra in Santiago de Cuba is accessed by 459 step climb to the “The Big Rock” or, in Spanish, La Gran Piedra. The viewing platform at its peak guarantees a cooler climate to help you freshen up after the onslaught of step after step. Even though the climb sounds fearful, it takes no more than 20 minutes but, do bring some comfortable shoes along. Legend has it that on a clear night one can see the lights of Montego Bay Jamaica from La Gran Piedra, however on the humid day we visited the visibility was greatly reduced. This fantastic site was declared a biosphere reserve by those great folks at UNESCO in 1987 and at just 20km from the center of Santiago de Cuba its certainly worth your time, especially because the Santiago de Cuba Botanical Garden is close by and it’s easy to combine both in one trip. The massive 50x25x30 meter rock is of volcanic origin, thought to have been pushed to this altitude by the movement of tectonic plates in the Caribbean region. Probably the most amazing view available in Santiago de Cuba and definitely worth the 459 steps to get to the summit!